John Gruber paints the picture of how different a game Amazon is playing. It’s a heads we win, tails you lose strategy. That’s the brilliance. If you buy an iPad but use Amazon’s iOS apps to read Kindle books and watch movies through your Amazon Prime account, Apple wins but so too does Amazon. If you buy a Kindle Fire instead of an iPad, Apple gets nothing. Amazon wins so long as you consume media content from Amazon, no matter if you play it on a Kindle Fire or an iPad. Apple only wins if you buy an iPad. I’m watching the Amazon’s kindle press event right now and as John points out, it’s definitely delivered too slowly. This article by Mark Sigal on GigaOM goes nicely with my post about disruption. We’re all lemmings in terms of following what works. So when the horizontal model made Bill Gates the richest man in the world, industry after industry embraced it as the one right way. With the advent of the Internet, however, a vicious cycle of commoditization — horizontal’s downside — began to play out. We are now at the endgame of that cycle, a point where few companies can make money via commodity economics, and HP and Dell are Exhibit A and B, respectively. “Free” Falling Out of Fashion? Reading Cap Witkins’ essay “Death of the Free Web” I have a though that the once rogue 37signals-ish view, that there should be more web apps build for profit, is going mainstream? It’s about time, I suppose. We’re discovering that you can’t create that sort of passion with free. And so we’ve begun searching for and creating services that not only solve problems, but also solve them in a way that puts the customer first. In doing so we’re creating smaller, but more lasting and passionate communities of people that believe not only in the products, but in the vision and principles behind them. The free web is dead. Good riddance. Patrick McKanzie about his rework of Server Density pricing model. At the very least it’s a good inspiration of how you should approach your pricing strategy. Also, have you read this one on pricing by Bidsketch founder? This article should give you quick overview of Clayton Christensen’s ground breaking book Innovator’s Solution and then I will try to apply his point onto the web application industry. 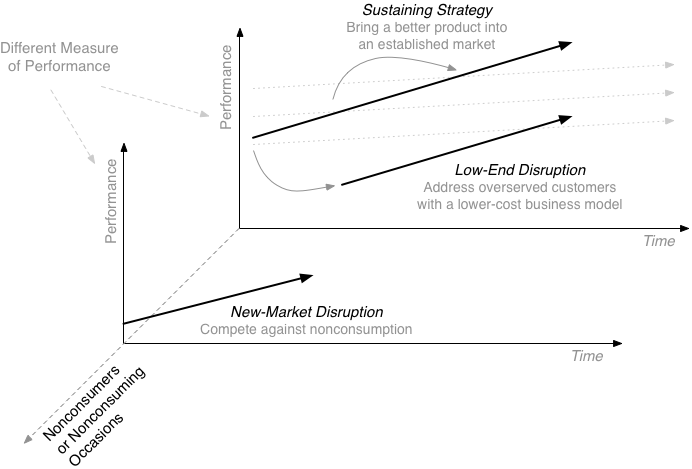 Disruptive innovations … don’t attempt to bring better products to established customers in existing markets. Rather, they disrupt and redefine that trajectory by introducing products and services that are not as good as currently available products. But disruptive technologies offer other benefits–typically, they are simpler, more convenient, and less expensive products that appeal to new or less-demanding customers. Disruption has a paralyzing effect on industry leaders. With resource allocation processes designed and perfected to support sustaining innovations, they are constitutionally unable to respond. They are always motivated to go up-market, and almost never motivated to defend the new or low-end markets that the disruptors find attractive. We call this phenomenon asymmetric motivation. You should definitely take a look at Innovator’s Solution, it’s great book and has more interesting concepts in it like the cycle between integration and modularization in an industry or the job to be done approach to business strategy. I will introduce you to two key concepts of the book – low-end and new-market disruption. Low-end disruption, as described by Clayton, starts at the low end of the existing market. But the lower price is a result of new business processes not just lower margin on the same process employed by established market players. One example of this strategy may be Walmart and other discount stores that offer their customers cheaper goods but compensate the lower margin via much larger amount of sold inventory and quicker turnover of inventory. So they may have lower margins than traditional stores, but they turn it over three times faster thereby more than making up for it. And then there are all the elaborate logistic things Walmart does, going so far as to direct their suppliers businesses in some ways. Another example may be personal computers, which were low-end disruption relative to the mainframes. Or now the tablets (iPad) which are disrupting the PC. The key is that there are overserved customers in the existing markets that are willing to let go of some features of the product in exchange for lower price, simplicity, convenience etc. Established players are motivated not to fight with the new entrant as he is attacking the least earning portion of their business. The target group of new-market disruption are non-consumers or non-consuming occasions. The disruptor is somehow able to transform existing product and get the new consumers. Example might be the first transistor radios that were too low quality for the existing customers but were great for teenagers who were able to listen to what they wanted for the first time. And they allow everyone to listen on the go or outside home, which was impossible before. The best thing from the point of view of the disruptor is that established market players ignore you for a long time because you are not eating their lunch. At least not for some time. And then it is too late for them. OK, this was really quick and simplifying intro, again, read the book and/or watch the videos linked bellow. In part 2, I will look at the implication of all this on the market of web applications. John Gruber (Daring Fireball) in one of his best pieces yet. Trust me, just read it. Are You Building a Product or a Feature? “Where to Draw the Line” is a clever post by Des Traynor of Intercom. So much is written about the pursuit of simplicity these days but often there is a confusion. There is a fundamental difference between making a product simple, and making a simple product. I like the advice to focus on user’s workflow in its entirety. It circles around the jobs-to-be-done approach of which I am more and more fan.